Microsoft are promising that a new update for DirectX 12 will bring huge performance boosts to games, especially at higher resolutions, and it's thanks to a new rendering technique that lowers the load on GPU's without any perceptible difference to the player. For each pixel in a rendered image, shaders calculate the color the pixel should be. Shading Rate determins the resolution at which said shaders are called, so a higher shading rate means more fidelity, but at GPU cost, but a low shading rate is the opposite. Microsoft have discovered that not all pixels require their own single shading rate, however, and VRS is a technology that can selectively reduce the shading rate in areas where the visual quality or fidelity is just not required, such as in dark areas or where there's relatively flat or basic textures. 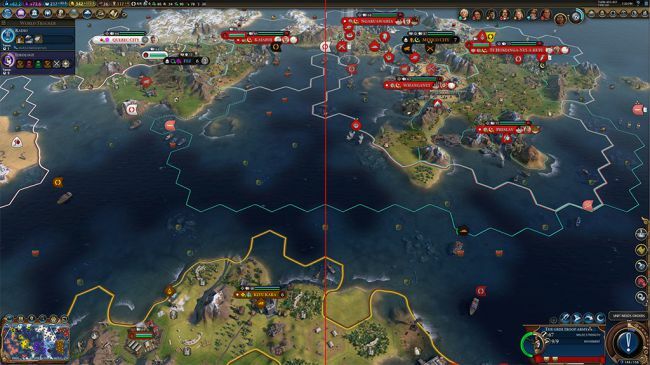 Based on tests done on a modified version of Civ VI, with the lower rates applied to terrain and water, a 20% performance increase was observed, with no noticeable loss in visual fidelity. Infact Microsoft challenge you to spot the difference in the image below. It's not an entirely new concept, as Nvidia have supported something similar in it's RTX and GTX 1160 GPUs, but it's general adoption by DirectX 12 will undoubtedly lead to much more widespread developer support. So while it's yet to be rolled out and implemented, and it wont benefit existing games unless developers add the feature, it's promising for future titles where more can be gained using existing hardware.